Please note that the content of this book primarily consists of articles available from Wikipedia or other free sources online. 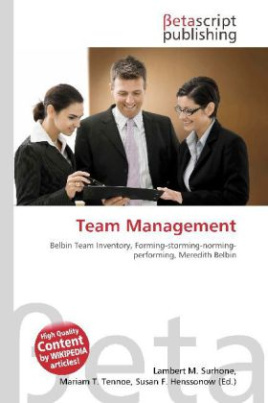 Team management refers to techniques, processes and tools for organizing and coordinating a group of individuals working towards a common goal i.e. a team. Several well-known approaches to team management have come out of academic work. Examples include the Belbin Team Inventory by Meredith Belbin, a method to identify the different types of personalities within teams, and Ken Blanchard''s description of "High Performing Teams". The ''Team Development Model'', identified by Bruce Tuckman, offers a foundational definition of the stages teams go through during their lifecycle. Those stages are labeled Forming, Storming, Norming and Performing.